The basis of many beloved desserts is often the meringues, or meringue, which is baked in the oven. However, rather, not baked, but dried at a low temperature. Meringue can be served in the form of a cupcake, as a separate dish, and can serve as a base for the cake, such as the well-known "Flight" or "Anna Pavlova". Bake the meringueso it turned out airy and light, as the famous ballerina, only from fresh eggs. Today we will bake cakes. Vanilla sugar – 2 teaspoons. Preheat the oven to 100-110 degrees. In a clean, dry bowl with high edges pour in the egg whites. Separate the whites from the yolks must very carefully so they are not mixed. In a blender, start whipping the whites on low speed, gradually increasing them. You will see that the mixture becomes white, and its density increases. When it is quite thick and will begin to form peaks if you lift off the whisk, continue beating, adding vanilla and regular sugar in small portions. The mixture should acquire a sleek look, and the grains of sugar in it to dissolve completely. Lay two baking trays with foil or baking paper. A table spoon or confectionery syringe shape cakes, laying them on the paper. If you use the syringe, the notched grooves will hold very well, because the resulting mass is quite dense. Put the trays into the oven and bake the meringue half to two hours. The surface must purchase a light coffee shade. After the oven is turned off, leave the trays inside because the baking process is still ongoing. After half an hour of meringue that you can get and carefully remove from foil, put on a large platter or tray. 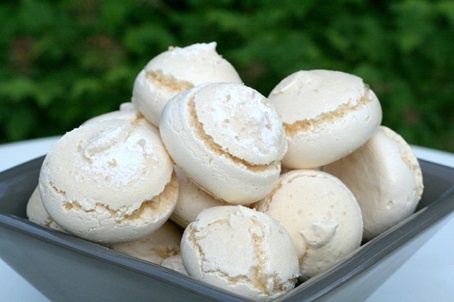 Meringues can be stored in a freezer without losing their quality for about a month. As a basis for cake, meringues are baked in a flat cake. If the cake garnish with whipped cream and sliced strawberries and kiwi, sprinkled with powdered sugar, you will be able to entertain guests or home the dessert "Anna Pavlova".